The first 18th century violin notes of the latest recital in the Durban Jewish Centre signified that here was a young master of his instrument. The player was a 31-year-old Russian violinist, Andrey Baranov. Accompanied by his sister, Maria Baranova (29), he gave a memorable performance for the Friends of Music in a programme that gave him ample opportunity to demonstrate his skills. In his relatively short career Andrey Baranov has won many international awards (as indeed has his sister) and it is easy to understand why. 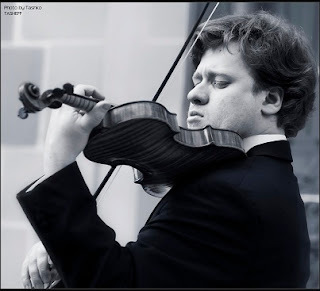 His technical abilities are exceptional, but it is the consistently full, rich quality of his violin tone that makes his playing truly remarkable. It was this that immediately commanded attention with the opening notes of the so-called Devil’s Trill sonata by Giuseppe Tartini (1692-1770). The work derives its name from the composer’s ingeniously fabricated story that the devil played the music to him in a dream. The music is in fact much better than the story. It is attractive and melodious, and Baranov played it with great poise and insight. This high standard was maintained throughout the rest of the programme. Two little-known and interesting compositions by Tchaikovsky were followed by Paganini’s celebrated La Campanella, which is perhaps most famous in its piano transcription by Franz Liszt. A sonata for unaccompanied violin by the Belgian composer Eugene Ysaye (1858-1931). The gentle and romantic Poeme by Ernest Chausson, who died in 1899 at the age of 44 when he rode his bicycle into a stone wall. Tzigane by Maurice Ravel (1875-1937), vivid music in a gypsy style. All these works demonstrated the versatile prowess of Andrey Baranov. His sister Maria made a notable contribution with keyboard parts that were often technically challenging. In response to an ovation from the audience they played more Paganini as an encore.